Getting to Geneva Airport (GVA) is easy by car, train, and bus. Private minibus transfers and shuttle van services run to Alpine ski resorts in France. 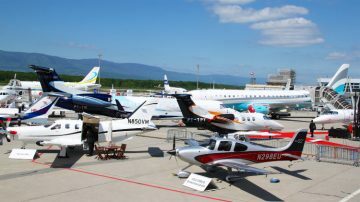 Geneva International Airport (Aéroport International de Genève) is conveniently located on the outskirts of Geneva. Getting to the airport is easy and often fairly cheap. Public buses run from the airport to most areas of Genève while train services are available to most parts of Switzerland. Buses go to many Alpine ski resorts in France. Driving is also a good option as Geneva Airport is next to highway Autoroute A1. Public transportation at Geneva Airport is available only from the Swiss / International part of the airport. Only a very limited number of taxis and car hire firms operate from the French sector. Driving to Geneva Airport is very easy as the airport is directly next to the highway Autoroute A1 that goes past Geneva via Lausanne to Bern, Zürich, and beyond. Parking is reasonably easy at Geneva Airport. Driving on the Autoroute in Switzerland requires the display of a vignette on the car windscreen. It is possible to reach Geneva Airport without using the Autoroute but a map may be essential. The road entrance to the French Sector of Geneva Airport is next to the Customs Post (Douane) at Ferney-Voltaire. Very few travelers actually have to use this entrance rather than the main airport facilities on the Swiss / international side of the airport. Taxis from Geneva Airport is expensive – around CHF45 to downtown and very pricy to other towns. Private airport transfers may be convenient for small groups or families traveling with luggage to destinations not readily served by public transportation. Advance reservations, especially on winter weekends, are advisable. Taxi2Airport and Suntransfers give online quotations without requiring personal information in advance. Buses provide useful and cheap transportation to Geneva Airport from Genève city as well as many cities in France. All buses depart from the Swiss / international part of the airport. Free Tout Genève public transportation tickets are available from the vending machine in the luggage claim area of the arrivals hall. These tickets are valid for 80 minutes on all Geneva Public Transportation buses, trams, boats, and trams. See Genève Public Buses to Geneva Airport for details on the ticket and bus services to the airport. Direct bus services from Geneva Airport go to several French towns including Annecy, Chambery, Grenoble, and Thonon-les-Bains. Sometimes trains are also useful although the connections are often not that simple and traveling times may be longer than the bus. The fastest link between downtown Geneva and Geneva Airport (GVA) is by train. The journey from Genève Cornavin train station to Geneva Aéroport station takes only six minutes. The Tout Genève ticket is valid on this section of the railway. Most Swiss long-distance trains to Geneva terminate at the airport. Direct train services are available to Geneva Airport from amongst others Bern, Biel, Fribourg, Lausanne, Montreux, Neuchâtel, Nyon, and Sion. Connecting trains can speed visitors to any part of Switzerland. Train services are also available to many stations in France but always require transfers. TGV Lyria trains do not stop at Geneva Airport station. Public transportation timetables and tickets are available from Swiss Railways and for French Railways from RailEurope (USA / World) or Voyages SNCF (UK). Trainlines is often the easiest service to buy online train tickets for Switzerland, France and most of Europe. Geneva Airport is a major arrival airport for travelers heading to ski resorts in the Alps in both Switzerland and France. During the winter sport season, many transfer services are available to ski resorts – most require advance reservations. Bus transfers are mostly used from Geneva Airport to ski resorts in France. Weekends, especially Saturdays, are the main transfer period with many additional buses connecting the airport with resorts in France. Transfers to Swiss ski resorts are rarely done by bus. Most skiers heading to Swiss resorts will take the train and change to local buses closer to the resorts. Private transfer services are of course available to any destination and are best reserved well in advance. Ski resorts or tourist offices can often provide information on services available to specific resorts and valleys, which may be cheaper than booking through a central reservation office. Compare various shuttle bus providers for the best value deals.